In 1972, Hasbro introduced a big-headed doll with eyes that changed color with the pull of a string. They were only manufactured for a year, and then countless unsold dolls spent decades in discount shops gathering dust. A few girls kept theirs, not caring that the rest of the world found their dolly a little freaky. 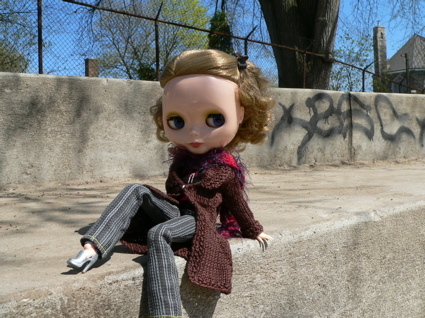 In the late 1990s, Gina Garan discovered Blythe for cheap on eBay, started dressing her up and photographing her and blammo -- a modern glamour girl was discovered. Gina is now Blythe's official photographer, and Blythe is her muse. As the appeal of the original doll grew, CWC arranged with Hasbro to make new Blythe dolls. Since 2000, when the first reproduction was released at the Japanese Parco department store, more than 50 neo-Blythe models have been released, with new models introduced every year. Formerly worth just a few dollars, original mint-in-box Blythes from the 1970s have sold for as much as $2000 on eBay in the last 6 months. 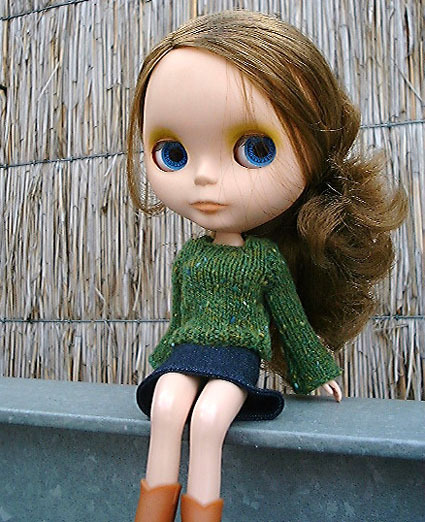 Blythe is already hugely popular in Asia, and her appeal is spreading. Recently, the Magic Pony gallery in Toronto [Knitty's home town] hosted the opening of Gina Garan's new show of photography and the "Behind Blythe" exhibit, curated by CWC Producer, Junko Wong. The tiny gallery was packed with Blythe fanatics photographing their own dolls alongside the ones on display, and buying new ones to add to their families. 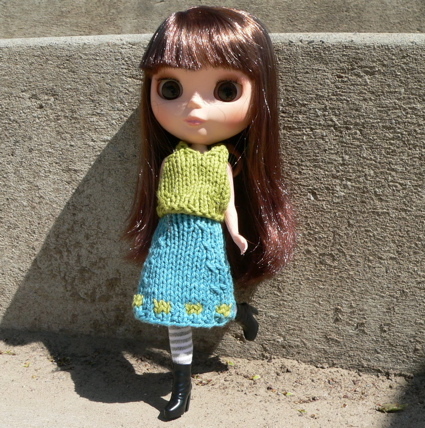 Blythe dolls are not for everyone, but for those who love them, finding things to dress them in is a big part of the fun. For them, we present the following four patterns. For those that have doll-lovers in their lives, please note: Blythe's body is about 22cm tall, the same size as a standard Skipper doll. The gorgeous brown silk coat is modelled by Figue, whose stock Blythe body has been replaced by a 27cm Obitsu articulated body -- hence her enhanced ability to pose. This body is about the same size as a standard Barbie. The coat is offered in both original Blythe AND large/Barbie sizes. 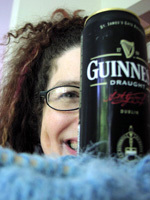 To learn more about Blythe, visit Gina Garan's This is Blythe site. The Blythes shown are not for sale. Try the This is Blythe buy and sell forum. Blythe is a dream girl. Blythe [Barbie]. Shown in Barbie size. Row 1 [RS]: [K1, p1] to end. Row 2 [WS]: [P1, k1] to end. Repeat Row 1 once more. Repeat these 2 rows 9 times more. 16 sts rem. Next Row [RS]: K1, m1, k to last st, m1, k1. Repeat these 2 rows twice more. 28 sts on needle. Work 2 rows in stockinette st.
Repeat these 4 rows 5 times more. 28 sts on needle. Next Row [RS]: BO 4 sts, k to end. Next Row [WS]: BO 4 sts, p to end. 20 sts rem. Cont in stockinette st until work measures 6 inches. BO all sts. Next Row [WS]: P to last 3 sts, k1, p1, k1. Next Row [RS]: K1, p1, k to end. Work 1 more row in patt as set. Next Row [RS]: Work in patt as set to last 3 sts, k2tog, k1. Next Row [WS]: Work in patt as set. Repeat these 2 rows 9 times more. 10 sts rem. Work 2 rows in patt as set. Next Row [RS]: K1, k2tog, k to last st, m1, k1. Next Row [WS]: P to last 3 sts, p2tog, p1. Next Row [RS]: K1, k2tog, k to end. Next Row [RS]: K to last st, m1, k1. Next Row [RS]: K all sts. Work 1 rows in stockinette st.
Repeat these 2 rows twice more. 9 sts on needle. Next Row [WS]: BO 4 sts, p to end. 5 sts rem. Next Row [WS]: P1, k1, p to end. Next Row [RS]: K to last 3 sts, p1, k1, p1. Next Row [RS]: K1, ssk, cont in patt as set. Next Row [RS]: K1, m1, k to last 3 sts, ssk, k1. Next Row [WS]: P1, p2tog tbl, p to end. Next Row [RS]: K to last 3 sts, ssk, k1. Next Row [RS]: K1, m1, k to end. Work in stockinette st until work measures 3[3.5] inches. Sew Back to Front at shoulders. With RS facing, pick up and k 13 sts along neckline edge of Right Front, 10 sts along Back Neck, and 13 sts along neckline edge of Left front. 36 sts on needle. Next Row: K all sts. NOTE: When working short rows, pick up wraps as you encounter them and work each wrap together with the st it is wrapped around. Continue in this manner, working each short row 1 st longer than the previous short row, until all sts have been worked. Next Row: [K1, p1] to end. Next Row: [P1, k1] to end. Sew snap to coat just below beginning of neckline shaping. Using MC, CO 8 sts. K 6 rows using MC. K 2 rows using CC. Repeat these 8 rows until work measures . Carry yarn not in use loosely up side of work. Work 6 more rows using MC. BO all sts loosely. Repeat these 2 rows once more. Cont in stockinette st until work measures 1.5 inches, ending with a WS row. Next Row [RS]: BO 3, k to end. Next Row [WS]: BO 3, p to end. Next Row [RS]: K3, place rem sts on hold. Next Row [WS]: P2tog, p1. Work 3 rows in stockinette st. BO all sts. With WS facing, place held sts on needle and rejoin yarn. P 1 row. Next Row [RS]: Ssk, k1. K 2 rows. Work in stockinette st until work measures .75 inch, ending with a WS row. Next Row [RS]: BO 2, k to end. Next Row [WS]: BO 2, p to end. Next Row [RS]: K4, place rem sts on hold. Next Row [WS]: P2tog, p2. Next Row [RS]: Ssk, k2. Sew back to front at sides. Sew snaps to ends of straps, so front straps overlap back straps slightly. On Blythe, cross straps in back before snapping. On Barbie, wear as a standard tank. Using MC, CO 18 sts. Row 2 [WS]: [K1, p1] to end. Next Row [RS]: [K2 using MC, k2 using CC] to last 2 sts, k2 using MC. Next Row [WS]: [P2 using MC, p2 using CC] to last 2 sts, p2 using MC. Break CC yarn. Decrease Row [RS]: K2, k2tog tbl, k to last 4 sts, k2tog, k2. Repeat these 4 rows three times more. 10 sts rem. Next Row [RS]: K2, k2tog tbl, k1, place rem sts on hold. K 2 rows. BO all sts. With RS facing, place held sts on needle and rejoin yarn. K1, k2tog, k2. Repeat these 4 rows three times more. 10 sts rem. BO all sts. Sew snap to top of back to close skirt. Jillian Moreno loves to watch people obsess. She knits and obsesses in Ann Arbor, Michigan. This pattern fits all Takara and Kenner Blythes and Licca bodies, too. I began collecting Blythe dolls about a year ago and for me it was the most natural thing in the world to start dressing them myself. I made up this simple pattern which I started to construct around the doll's body. The sweater has a ribbed welt around the bottom, a round neckline and flared sleeves. Work in 1x1 Rib for 3 rows. Work in stockinette st until work measures 1.5 inches (or desired length to underarm), ending with a WS row. Next Row [RS]: BO 2 sts, k to end. Next Row [WS]: BO 2 sts, p to end. Next Row [RS]: K2tog, k to last 2 sts, ssk. 14 sts rem. Next Row [RS]: K3, k2tog, place rem sts on hold on waste yarn. Next Row [RS]: K2, k2tog. Next Row [RS]: K1, k2tog. Replace held sts on needle. With RS facing, rejoin yarn. BO 4 sts, ssk, k to end. Next Row [RS]: Ssk, k to end. Repeat these 2 rows once more. BO rem sts. Next Row [RS]: K2tog, k to end. 9 sts rem. Work 6 rows in stockinette st.
Next Row [WS]: BO 5 sts, p to end. Work in stockinette st until work measures 1.5 inches (or desired length to underarm), ending with a RS row (Left Back to underarm should be 1 row shorter than Right Back). Next Row [RS]: K to last 2 sts, k2tog. 9 sts rem. Next Row [RS]: BO 5 sts, k to end. Repeat the last 2 rows once more. BO rem sts. Beg with a WS row, work 3 rows in stockinette st.
Next Row [RS]: [K2tog, k4] to last 2 sts, k2tog. Next Row [RS]: K2, k2tog, k to last 4 sts, k2tog, k2. 14 sts rem. Cont in stockinette st until work measures 2 inches, ending with a WS row. Next Row [RS]: K2tog, k to last 2 sts, ssk. Next Row [RS]: K2tog, k to last 2 sts, ssk. 4 sts rem. Sew backs to front at shoulders. Sew sleeves into armholes, beginning at shoulder. Sew snaps to sweater backs, so that backs overlap slightly. Position one snap at neck edge and one snap just above bottom ribbing. Liz lives in London, England. She began knitting at an early age and grew up to have her knitted Rock Star dolls featured in the UK Music magazine Mojo in 2000. Since then she has acquired a huge family of Blythe dolls and they have become the main focus of her knitting activities. She has developed many new styles and undertakes private sweater commissions for Blythe dolls and their owners all around the world. Patterns © 2005 their respective designers. Images © Amy R Singer, Liz Powner. BLYTHE is a trademark of Hasbro. (c)2002 Hasbro. All Rights Reserved. Licensed by Hasbro Consumer Products.